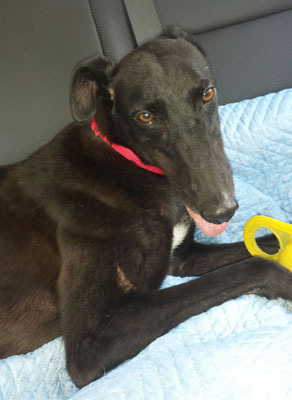 Rita is a 2½-year-old black female born October 4, 2010. Her sire is Dodgem by Design and her dam is Joni Jo. Rita has no races on record. Rita and Tina were found as strays in Amarillo and were turned in to the Humane Society there. Rita was under the care of Dr. Wick Culp of the Animal Medical Center in Amarillo, who completed her medical procedures. This gorgeous girl is ready to meet you! Better pictures coming soon. 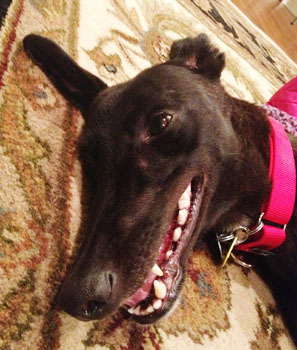 Rita has passed an initial cat test and is living in a foster home with a cat and other greyhounds.